Heil PR-781 Independent review of the PR-781 From the amateur radio division of Heil Sound, Ltd., we present the PR 781, a professional quality dynamic cardioid microphone for amateur radio that is specifically designed for use with most makes of Elite tranceivers of Kenwood, Yaesu, Ten Tec and iCOM. This is a truly remarkable dynamic microphone. Heil engineers were requested by ICOM to develop a very special microphone package for their new iC 7800 radio. They didn't want just a microphone; they wanted a SUPER microphone for a super radio. The Heil PR 780 was born. The PR 781 is an improvement on the popular PR 780. The PR 781 is a beautiful performer into just about any microphone input, such as TS 870, 950, Pro 1, 2, 3, Yaesu Mv 5, MP, 2000 and 9000. 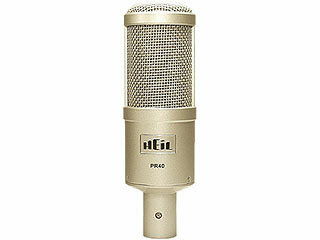 Using one of the dynamic elements from the Heil broadcast division, the PR 781 offers beautiful wide frequency response while keeping that traditional Heil Sound articulation of the speech pattern something ALL microphones seem to lack and that has been the mainstay of the Heil Sound line up. The PR 781 comes with the SM 3 mount. The SM 2 shock mount can be used with the PR-781. *A CC-1XLR K Y or i (K=Kenwood, Y=Yaesu and i=iCOM) is needed to interface with any transceiver. Please check Microphone/ Cable selection chart for compatibility. Generating Element Heil PR Dynamic Frequency Response 50 Hz to 16,000 Hz Impedance Balanced 600 Ohms Output, 3 pin Polar Pattern Cardioid Output Level -55 dB Diaphragm Low-mass aluminum Finish Black Satin Epoxy Net Weight 14 oz. Heil Sound is pleased to introduce The Fin, exhibiting a remarkable, natural, clear sound and designed especially for live sound, recording and broadcast applications. The exceptional performance is achieved by the use of a special magnet structure with a large 1 1/18" aluminum low mass voice coil assembly similar to the Heil PR 20. The frequency response is 60 Hz - 18kHz with that traditional Heil Sound mid range 'bouquet' at 4kHz, which presents incredible brilliance and presence. The Fin exhibits a tight linear cardioid pattern. The chrome finish is a special 'showchrome' where the steel body is copper plated and then double chrome plated producing a deep chrome finish. A blue molded internal foam windscreen inside the grill covers the large diameter Heil dynamic microphone element mounted in a specially tooled Sorbothane © shock mount. The fun part of The Fin is the four blue L.E.D. lamps mounted inside. 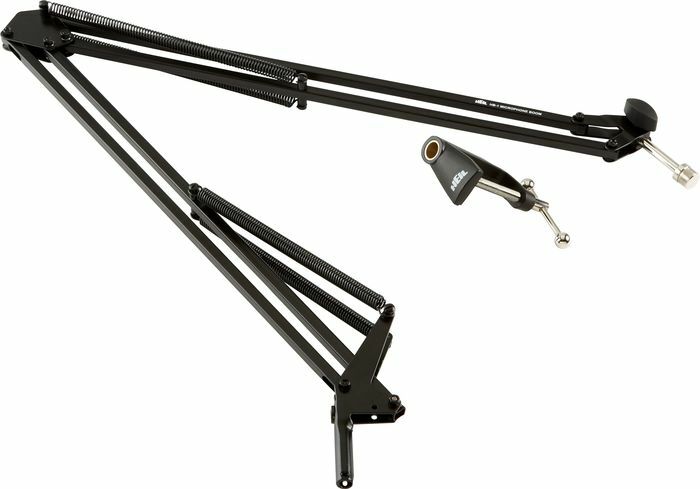 These can only be illuminated when using The Fin into one of the 3 pin balanced XLR inputs of a professional mixing console that supplies a + 48 volt d.c. phantom voltage down the balanced mic line. The best microphone Heil has to offer. Very nice frequency response. The Pro Micro Dual Side is a very unique high performance dual sided headset. The headset is outfitted with the HC-6 element. Designed for commercial broadcast applications, the -3dB points are fixed at 100 Hz and 12 kHz with sensitivity of -57 dB at 600 ohms output impedance (centered at 1 kHz.) The microphone audio for the Pro Micro series terminates into a 1/8” male plug while the head phone terminates into a 1/8” stereo with adaptor. To adjust the headset simply bend the stainless steel piece that is inside the black padded headband.